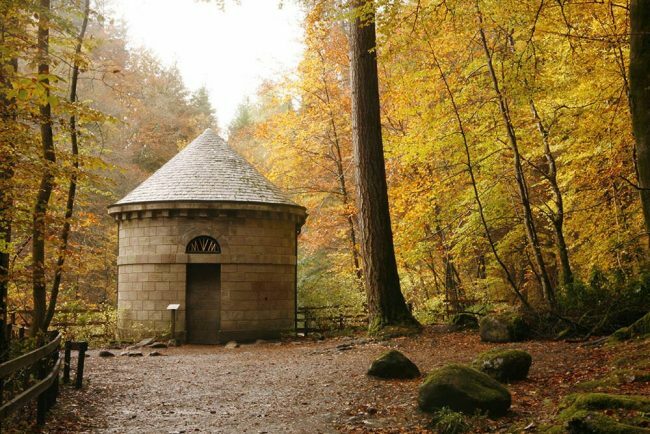 This stretch of magical Perthshire forest was originally designed as a pleasure ground in the 18th century for the Dukes of Atholl. Douglas firs tower over the paths leading to the roaring Black Linn Falls, where the River Braan crashes down into the deep, foaming pools below. Overlooking the waterfall is the picturesque folly known as Ossian’s Hall, built in 1757 as the focal point in an extensive designed landscape. Decorated with mirrors, sliding panels and paintings, it has been refurbished to re-create the illusions of shock, surprise and amazement that were the aims of the folly’s original design. It makes a fine spot to contemplate the roaring, tumbling falls.